Last week, media reports suggested that Facebook is getting the unsend feature to its Messenger app. The social networking giant decided to take this step after it faced a lot of backlash after deleting CEO Mark Zuckerberg’s messages from several recipients’ inboxes earlier this year. The very transparency of the platform was questioned. 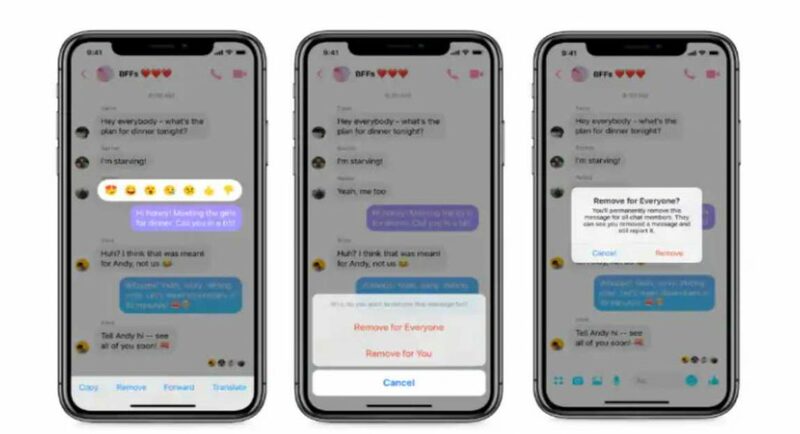 It was then that Facebook announced that it will get the ‘Unsend Message’ feature to its Messenger and make it available to all. And now, the feature has finally been rolled out in Facebook’s app. The Unsend Message feature has started rolling out to both Android and iOS users in Poland, Bolivia, Colombia, and Lithuania. And according to a report in Techcrunch, a Facebook spokesperson has confirmed that the worldwide roll out will also be happening “as soon as possible”. The feature is called ‘Remove for Everyone’ and it will enable users to delete any message or file they have sent in Messenger. However, they will only be able to do it within 10 minutes of sending it. Long press on the message you want to recall. On doing this, two options will pop-up on the screen — ‘Remove for Everyone’ and Remove for You’. Facebook will then prompt a warning message — ‘You’ll permanently remove this message for all chat members. They can see that you removed a message and still report it’. This will be coupled with ‘Cancel’ and ‘Remove’ options. He has also been quoted saying that the feature rolled out to common public isn’t the same as the one that is available to the executives of the company. It is also worth noticing that when Mark Zuckerberg’s messages were deleted from people’s account, the tombstone message indicating that a message was removed.